There are some excellent, cute winter boots designed primarily for infants. This footwear does not look like your standard winter boot but instead has designs features to ensure that boot stays on your baby’s foot and don’t get lost. Winter baby boots also have excellent insulation, so your infant’s feet stay warm even on the coldest days in any situation. 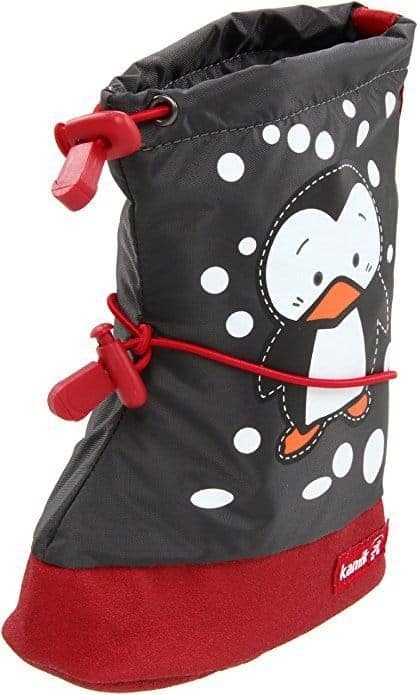 We review five of the best booties that will keep your child’s feet toasty and warm all winter. These are fantastic boots for your baby. Not only are they warm and they won’t fall off, but they also come in a tonne of super cute patterns and colors. My favorite thing about these boots is that they have a two toggle system that means they will stay on, no matter how much your baby tries to get them off. Another thing that is great about these boots is that they have a skid-resistant and waterproof sole, so when your baby starts to walk you can be sure they won’t slip and will be able to stay warm and comfortable. The bottom also has something called a PLUSfoam sole that is made up of 100% recycled and recyclable materials. These boots are incredibly versatile they can be worn in fall, winter or spring for all different kinds of weather conditions, you just have to layer them up or down depending on the how cold it is. 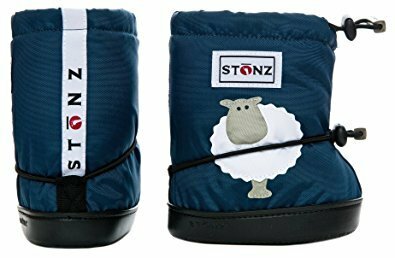 They come in a variety of sizes and can be worn over bare feet, socks, slippers or shoes, or you can purchase separately a Stonz Sherpa Fleece Liner to keep them extra warm and cozy. These Molehill boots have a similar design to the Stonz, but they have a plush polyester fur combined with a Thinsulate fill lining that you don’t have to purchase separately. 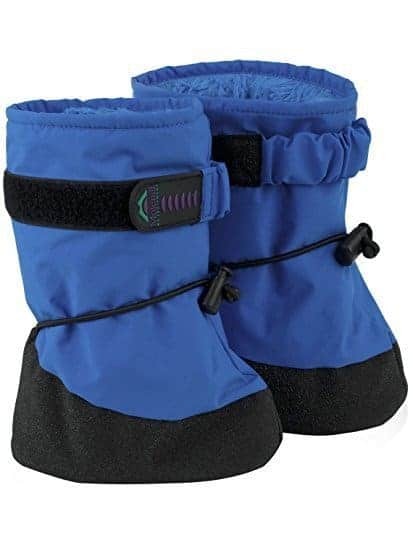 They are great for playing in the snow and the hook-and-loop closure at calf and bungee cord at the instep help to ensure that these boots won’t come off. This design is water and wind resistant and is made of a Teflon-coated, breathable nylon shell. There is also a skid-resistant, rubber outsole that provides grip and traction in the snow. These North Face Booties are a little bit of a different design. They look adorable and are a warm, fuzzy high-loft fleece. They fasten with medial and lateral Velcro® tabs so that they won’t fall off. These are made for infants from birth to 9 months. They come with a limited one-year warranty. Kamik is a Canadian heritage brand (they have been around for almost 120 years). They specialize in rain and winter boots, and the company focuses a lot on sustainability and the environment. These cold weather booties are pretty adorable, while at the same time hearty enough to keep your baby warm in the most frigid weather. They are made of waterproof nylon and have a synthetic sole. The lining is fleece, and it has two bungee fasteners, one midway up the booties and one at the top. 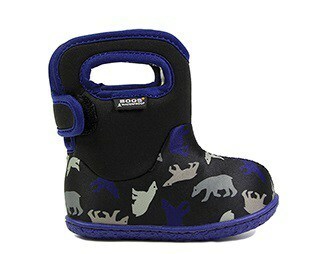 Another great winter boot is the Baby Bogs design. Not only do these boots come in adorable patterns for infants, but they are also waterproof so your child can wear them in the snow and the rain. They are lightweight and machine washable. Kids love them because they are easy to put on using the kid-friendly handles. Will they keep your child’s feet warm? The most important part of finding the right winter boot will be whether they keep feet warm. To ensure that you get a product that will be warm, check the material that the boot is made from. Make sure you pay particular attention to the lining and whether it is waterproof or at the very least water resistant. The other most important thing to look for in any footwear for a baby is whether it is going to stay on. Babies love taking off their shoes, or sometimes they just fall off in a stroller, and you have no idea where they have gone. If it is cold you don’t want to risk losing boots (especially ones you may have paid $50+ for), so look for designs that have fasteners that secure the boot around the ankle area and again at the top of the boot. Can you wear them in the snow? Playing in the snow is one of the great joys of being a child. If you get a lot of snow where you live and are expecting to let your baby play in it to some degree, make sure you get a boot that will work well in the snow. You will want a really warm design, has a gripped sole and are high enough that the snow isn’t able to get into any parts of the boot. 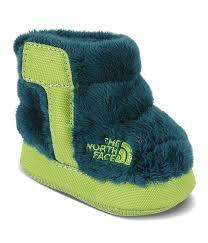 Look for waterproof booties, this will help to ensure that your child’s feet stay warm and DRY. If your baby does start walking it is nice to have a boot that has a bit of a grip on the bottom. It will help stop slipping and make it easy to walk. How are the boots meant to be worn? This may sound like an odd thing to think about, but some of the designs for infant booties can be worn over shoes. Some customers buy booties in larger sizes and just layer heavy wool socks under the booties. It allows you to get a more extended amount of wear out of the boot and they can grow with your child. Are they easy to put on? Sometimes a style can look amazing but be a real pain to put onto your baby. Since you don’t want to struggle to get boots on your child, make sure you look for models that will be easy to take on and off. Are the soles flexible for new walkers? Since most babies take their first steps between 9 and 12 months of age, you may want to avoid the fabric booties and look for boots that have a rubber sole that has some grip.